Have you found yourself wanting to invest in things that make running your business easier? Who doesn’t? We’re only human. We like to take the easy road and have templates and road maps, and there’s actually nothing wrong with that. Except when you solely rely on it without considering if it’s the right voice to represent your business. In this episode of the Social Media Marketing Happy Hour, Dawn and Traci share a few of their experiences gone wrong when not tailoring their marketing to suit their voice and their audience. 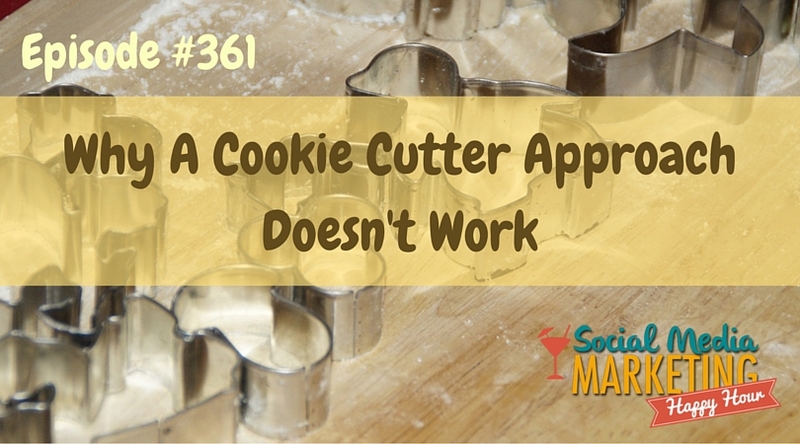 Is there value in cookie cutter systems? Sometimes, we fail to see that because of using those cookie cutter systems, our brains are slowly going to sleep. Not only that, we also begin to lose sight of who we are and what we represent. Don’t get us wrong, there is value in buying templatized programs. Both of us are fans of it and Dawn even has a coaching program that’s like that. What we’re saying is you have to keep your critical thinking brain in action in spite of using these models. It’s human nature to want someone to tell you what to do. If you’re not an expert at it, you seek a plug and play solution because you want someone to guide you. However, when you’re not using your brain anymore, you’ve fallen prey to this. And chances are, you’ll fail to represent your brand. You shouldn’t expect a template to come across the way imagine it to. What you should do is get a basic template you can tweak an make it fit your voice and appeal to your avatar. Kind of like building a house. You get to choose the model or the template of the house, but you are allowed to customize it so it won’t look like every other house around the neighborhood. In other words, you make it your own. Happy Hour also fell prey to plug and play models. Before, Happy Hour got templates from really great marketers and we thought those templates were fantastic. We started sending out form emails but later realized that those templates were more male-centered. It had a more aggressive tone, far from the tone we have at Happy Hour. It’s not to say that males don’t do a good job, in fact, a lot of the best marketers are males. It just didn’t have the voice that we wanted to impart. Not only emails, we also created an entire course around an amazing marketer that we got some coaching from and we used a model that was male-dominant. We decided to follow this presentation model and it just happened to have a pretty hard-core pitch. Thinking that this guy was so good at what he does, we went ahead and followed it. The result for us? So many of the listeners on that webinar bailed out on us. Why didn’t it yield the same results for us as it did for him? Part of the reason it ended up this way is because we abandoned who we were. We’d like to think that the reason people listen to Happy Hour is because we give good advise and we do it with fun! By copying everything from that presentation model and forgetting about what makes us special and authentic in the process, we didn’t achieve what we set out to do. Again, we want to make this clear — we love our male listeners and we have nothing against men! What we’re trying to say is that the way women speak vs. the way men speak is totally different. Sometimes, a male voice will not resonate with a female voice and vice versa. Know who you are and be authentic. For solopreneurs, entrepreneurs and small business owners who do it themselves, you try do everything the best way you can. But it’s normal for you to follow somebody that you think is more successful and more knowledgeable than you. Just remember that you have a voice too. Finding your voice and being authentic to who you are is crucial. Don’t be afraid to tweak that template and put the a spin on it with your brand. Keep up with the changes in the marketing world. Let’s say you’ve implemented something in the past that worked, it doesn’t mean that it’ll still work now. Marketing is always evolving and so you have to evolve with it too! You have keep testing things until you find a method that works for your brand. Be around people who are like you and whose brands are closest to what you want to be doing. For example, if you are a woman and you’re planning on marketing to other women, you should pay close attention to the way other female marketers do it. You could also be a man who’s avatar caters to women, so you need to listen to that female voice. It doesn’t matter who your avatar is. You want to be able to tailor your processes into something that your target audience will understand and enjoy. So look at these programs, templates and resources as platforms that you can build upon. Don’t follow it as is because your business is different and unique from everyone else’s! If you are someone who has gone down the cookie cutter approach or you just want an extra set of eyes on the way you’re doing things, apply for a free business assessment with Dawn or Traci. Just go to http://HappyHourHangouts.com/coaching.